Latin for 'leaves like a lili'. Acriopsis javanica var. nelsoniana (F.M.Bailey) J.J.Sm. Growing in freshwater swamp forest, mangrove forest, lowland evergreen rain forest as well as beach vegetation, and occasionally on roadside trees. 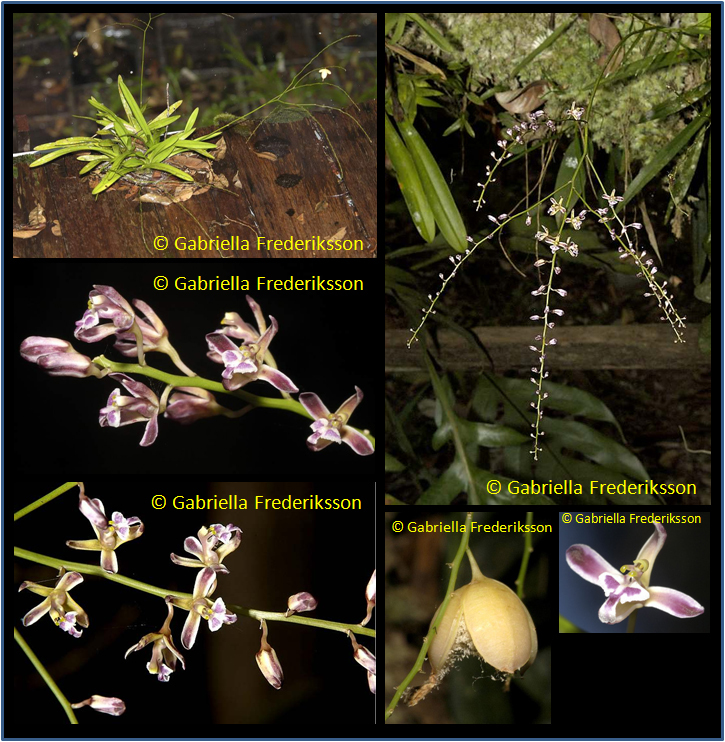 In its microhabitat, Acriopsis liliifolia usually grows close to the ground and typically develops a mass of aerial or ¡°catch roots¡± that are used to catch falling debris for nutrition. This species is also almost always found associated with ants such as Crematogaster species although other ants such as Camponotus species are known to live in the root mass. The Crematogaster species usually builds nest in the aerial root ball of the orchid, swarming around the plant when it is touched or disturbed. In this animal-plant association, the orchid seems to provide the ants with a lattice-like framework for nest-building, while the ants in return provide protection as well as nutrients (waste material from the ants) to the plants. From Indochina to New Guinea, the west Pacific and northern Australia.